This book is a refreshing and welcome reminder that we have made progress. I doubt it could have been written, never mind published, 30 years ago. Starting with a chilling account of her 48-year-old mother’s death from lymphoma, complete with the serious lack of attention to the needs of the patient and family (that I recognized immediately), it blossoms into a nuts-and-bolts description of how nurses can better care for the dying. It is based on the CARES tool developed by Freeman. ‘C’ is for comfort and includes both pain management and general comfort measures, and includes things like non-essential observations, lab tests, IV fluids, positioning, and a lot of other things directed at patient comfort. Moving with the times, I was surprised there was no comment about the management of implanted defibrillators. ‘A’ is about airway management and secretion control. ‘R’ is about restlessness and delirium commonly seen in the dying. ‘E’ is about emotional issues common to the dying and their families, including spiritual concerns. ‘S’ is about self-care for the nurse or other healthcare professional. 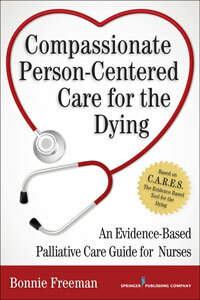 This book provides the essential information on how to effectively care for the dying, presented in a relatively concise (non-encyclopedic) but very practical manner – ‘in a readily applicable format for the bedside nurse.’ I liked it. And buying the book gets you a Smartphone app, so you can access all the pearls and reminders on the ward. The RRPs quoted are from Amazon.com and Amazon.co.uk. The English price is significantly higher than the American price, the reason for which is not apparent. This book builds on the premise that bereavement is a family affair and that management and treatment should be family based rather than for individuals. I was surprised that this notion had only surfaced in clinical care as recently as 1965. 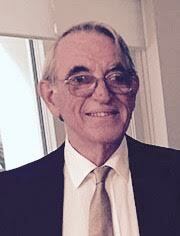 David Kissane was a driving force behind the Family Focused Grief Therapy Trial in Melbourne in the 1990s (Kissane and Bloch: Family Focused Grief Therapy, Open University Press, 2002), and he has since overseen a larger Family Therapy Grief Trial during his time at the Memorial Sloan-Kettering Cancer Center in New York. I doubt that many would argue with the concept of family-centered bereavement care, although some may appreciate some guidance about how to go about it and that is what this book sets out to do. Part I provides an introduction and overview. Part II includes chapters on assessment, therapeutic techniques, and the influence of culture. The next deals with particular circumstances including traumatic loss, suicide, perinatal loss, the death of a child, anticipating the death of a parent, and therapy for older grieving people. The last deals with future directions – where family-centered bereavement care might take us in the coming years. This book will be of interest and useful to anyone who works in, or has a special interest in, bereavement care. A 23-year-old, armed with a degree in medieval history, working in the cremation industry? The first couple of chapters were a little breathtaking and included some descriptions about the cremation process that even I found confronting. But I also found wonderful descriptions of ancient, medieval and recent practices surrounding death. Why the Hindu Vedas cremated corpses four thousand years ago, what they did to those accused of practicing witchcraft in medieval times, what the Tibetans do where there is no wood for fires, to cannibalism in the twentieth century. Along with this is a sensitive and respectful commentary on what is wrong with our current practices surrounding death and the disposal of remains. She recounts what happened during the American Civil War, when so many soldiers died in the heat of the South and railroads started to refuse to carry decaying bodies not in sealed iron coffins, which was too expensive for most families. ‘The situation brought out the entrepreneurial impulses of men, who, if the family could pay, would perform a new preservation technique called embalming right there on the battlefield. They followed the skirmishes and battles looking for work, America’s first ambulance chasers.’ She reflects on Jessica Mitford’s The American Way of Death and provides a number of examples where things could have been done better. And all with some self-deprecating humor. This is a serious book about what is wrong with our system. 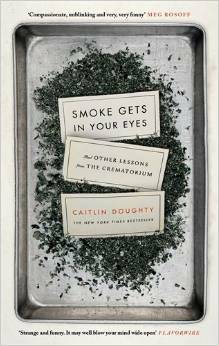 Caitlin Doughty has founded a website The Order of the Good Death.com that hosts a web series, Ask the Mortician. I enjoyed reading it and feel it is another step towards normalizing death in our societies.